Charles Fillmore died yesterday at age 84 after a long battle with cancer. A brilliant linguist, especially in the field of lexical semantics, who influenced so many of us Berkeley students and colleagues elsewhere. He was sweet and funny and loving, and deeply devoted to [his wife, Berkeley linguist] Lily Wong Fillmore. The loss of my Doktorvater feels like the loss of a parent. This profile from Berkeley's International Computer Science Institute gives an outline of his illustrious career and the breadth of his scholarship in the field. 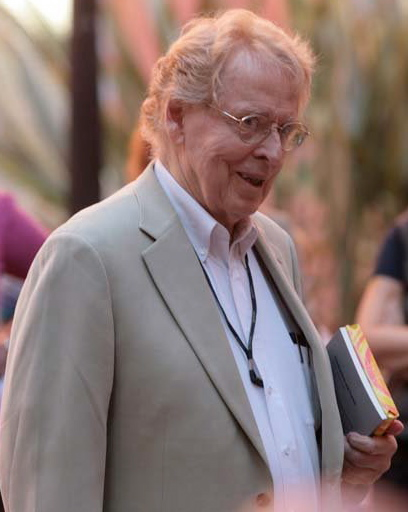 Charles Fillmore, director of ICSI's FrameNet Project and professor emeritus of linguistics at UC Berkeley, has studied language in wildly different settings over the course of his sixty–year career. Fillmore received his undergraduate degree at the University of Minnesota, after which he spent three years in the U.S. Army stationed in Japan, intercepting coded Russian conversations on short–wave radio. When he was off duty, he walked around the streets with a notebook and worked at teaching himself Japanese. After he was discharged — the first U.S. soldier to be discharged locally in Japan — he taught English at a Buddhist girls' school while taking classes at Kyoto University. He returned to the U.S. to receive his doctorate at the University of Michigan, and then spent ten years teaching at Ohio State University in Columbus. He spent one year as a fellow at the Center for Advanced Study in Behavioral Sciences at Stanford University in what he calls "senseless luxury," and came to UC Berkeley in 1971. According to FrameNet PI Collin Baker, Fillmore "has been a quiet voice of reason in the linguistics wars over the decades, because he's always been true to the data." While many linguistics theories attempt to describe all aspects of a language — working from the top down, as it were — Fillmore works from the data within a loose conceptual framework, allowing for exceptions to his theories. This flexibility forms the basis of Fillmore's brand of linguistics. Fillmore has helped develop some of the fundamental concepts in linguistics as it is practiced today. In the 1960s and 1970s, he developed the theories of case grammar and frame semantics, and in the 1980s and 1990s he developed and contributed to work in construction grammar. "I've always been interested in meaning as much as form, and the relationship between form and meaning," he says. During the early 1990s, he taught summer school classes in computational lexicography at the University of Pisa. There, he met Sue Atkins, a lexicographer with whom he continues to collaborate. At the time, Atkins was involved in a European Union–funded project that was using frame semantics to study perception verbs in English, French, Danish, Italian, and Dutch, and he joined the group as an external consultant. "I gradually convinced myself that we had to do something like that in Berkeley," he said. Fillmore retired from UC Berkeley in 1995, and shortly afterwards, then–ICSI Director Jerome Feldman invited him to join the Institute and write a proposal for lexical semantic research. In 1997, the group received its first grant and began to build the FrameNet database, which shows English words in each of their senses and lays out the ways in which they combine with other words to build complete phrases. The FrameNet Project aims to cover as much as possible of what is involved in understanding text. Words are grouped according to the semantic frames — schematic representations of situation types (like eating, removing, etc.) — that they participate in, and the patterns in which they combine with other words and phrases near them are described according to how the frame elements get expressed. Frame elements are the things that are worth talking about when a frame has been activated by a word. For example, verbs of buying and selling need to connect with a buyer, a seller, some goods, and some money, either explicitly in the sentence or implicitly in the situation in which they are used; verbs of revenge have to involve an avenger, an offender, an injured party, and a punishment. "The happiest time of my career has been here at ICSI," says Fillmore, "where FrameNet has made it possible for me to work with a team of bright young people on a continuing basis doing work that I'll never lose interest in." Over a decade after its inception, the FrameNet Project continues to add to its database. The project has manually annotated over 150,000 sentences, and has defined more than 10,000 lexical units (a pairing of a word with a meaning), 6,000 of which have been fully annotated. The FrameNet Web site includes a searchable database that gives users lists of frames, frame elements, and example sentences for all of the possible meanings for each word. The team has also been adding descriptions of the formal and semantic properties of special grammatical constructions that have meanings that can't be predicted from the meanings of their parts. "By finding representative examples of the uses of each word and classifying the meanings of the phrases that go with them, we are able to include in our database information about the words in our language that standard dictionaries simply don't have room for," he says. "We're building information about English for both people and computers — for people who want information about English and the way the mind works. And people who want to design programs need to have this information available." The FrameNet resource has been used in the creation of lexicons for other languages and in the development of various natural language processing applications such as question answering and machine translation. Other researchers have begun creating FrameNets for several languages besides English, including Chinese, Japanese, German, Spanish, and Hebrew. As they build these FrameNets, they are finding that different languages have many of the same frames and use words in semantically similar ways. The hope is that frame semantics will one day guide automatic machine translation. The FrameNet database is in use by hundreds of researchers around the world, and Fillmore's work is continually recognized by his colleagues. In 1991, he served as president of the Linguistic Society of America. In 2000, he was awarded an honorary doctorate from the University of Chicago; in August 2009, a three–day conference was held at UC Berkeley in celebration of his 80th birthday, with papers on frame semantics and construction grammar by dozens of his former students and colleagues. He was the subject of an interview published in this year's Review of Cognitive Linguistics, and in December 2009, he conducted the FrameNet Masterclass and Workshop at the Eighth International Workshop on Treebanks and Linguistic Theories in Milan, Italy. Here is a video that he made in 2012 on the occasion of receiving the Lifetime Achievement Award from the Association for Computational Linguistics. Thank you for posting this. I so enjoyed taking classes and seminars with Chuck at Berkeley in the '90's – he was gracious, encouraging, brilliant, and deeply grounded in real data. I'm sad that he's no longer with us, and happy for him that he led such a creative, engaged life. Chuck Fillmore is one of a handful of modern linguists whose theoretical and empirical work has staying power. It has already influenced generations of linguists, and its effects on the theory and practice of linguistics will only continue to grow. Chuck was one of my teachers at Berkeley and was on my doctoral committee. I have always thought of him with the greatest respect for not only his teaching, but his insight, his intelligence, and his warm heart and openness. Thanks for posting this. I wrote my thesis on a topic in construction grammar, so some of his work has been extremely influential on my own. That is very sad news. Inspired me to write my own profile of how I see Fillmore's influence on modern linguistics. Including some quotes from key papers: http://metaphorhacker.net/2014/02/linguistics-according-to-fillmore. No doubt, his work is with us to stay. Chuck was truly a man of wisdom, and one of the few linguists that linguists of all walks listen to with respect. I believe that notions he brought to modern linguistics—prototype, frame, and construction—are the most important foundations in our field. I regret his passing away but am glad that I've learned from him. Chuck taught me so much about language and life. I now feel an unimaginable sadness to hear that he's gone. But at the same time I feel truly blessed to have had the privilege of knowing him and benefitting from his knowledge, wisdom, insight, and humor. Chuck was my first cousin, 4+ years older than I. We lived across the street from each other. His childhood accomplishments were as spectacular as his adult accomplishments. He was a very important part of my life while growing up.